Why do we use foam boards? This is a question many of you may ask. Some of you may be eager to try the “real deal” but in all reality, foam boards are the real deal. You may visit other surf schools around the world that teach you how to surf on a fiberglass board and that is all fine and dandy but the best surfers will tell you to start off on a soft top. There are many reasons for this and this blog will break it down for you. We will discuss benefits of learning on a foam board and what brands we recommend you buy if you are interested in getting one outside of a lesson. There are several reasons we recommend learning how to surf on foam boards. First and foremost, when the board hits a student or wipes out it doesn’t hurt them. Not to mention, the high volume of these boards makes them easier to pop up on. The high volume also makes them easier to paddle through waves. 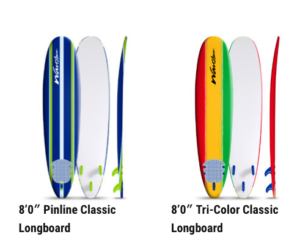 Regardless of the way they look, as soon as you start making your way into shorter fiberglass or epoxy surfboards, you increase the paddling difficulty, the pop-up instability, and the riding instability. Just as important, is the fact the foam boards can catch foam waves much easier and the fiberglass boards need the power of a wave about to break. Therefore you don’t need a huge wave to be able to stand up. Riding a fiberglass or epoxy board in the foam or white water is difficult especially the pop-up. Learning to surf, riding green water waves is difficult. You enter a whole new level of timing and techniques. Progressing from foam to green water waves on a high volume board is the easiest transition. This you can ask any surf instructor and or professional surfer and I guarantee they will agree. You can learn a lot riding foam boards. You learn the timing of catching waves and popping up. The next step is to ride small green water waves that require a very accurate pop-up and very good posture to absorb the speed of the real wave. The build-up in confidence is necessary and should not be overlooked. This is because the accidents get more violent as you step up in wave size. A foam board can ride anything from a small crumbly whitewash wave to a seven-foot wave. Many of our instructors will tell you that you can learn to maneuver including cut backs, accelerating, pumping, and driving. The only limitation emerges when you desire to start ripping the lip by running the board up the face. There is a lot to learn on any board before a surfer is ready to rip and shred. Most beginners though won’t be at this stage until putting in some serious time and practice. 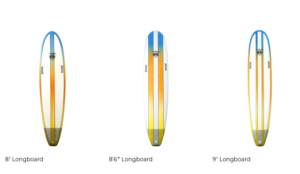 The best brands of foam boards we recommend to our surfers are Wavestorm and BruSurf. Both of these brands we use for our lessons and surf camps. You can purchase Wavestorm’s at Costco for fairly cheap and BruSurf is mainly an online platform.